We’re currently in the early stages of the 2012 NBA Playoffs but for many domestic leagues around the world where the season is over, the focus right now has shifted to the 2012 Olympic Games in London. With that in mind, let’s take a brief overview of what is to come in the mens tournament. Since the team rosters — and even some of the competing teams themselves — are yet to be finalised, this will be a high level preview of what is to come. As the Olympics approach, we’ll get into more detail with predictions and in-depth comparisons. Firstly, let’s examine the format that will be taken on by the tournament. There will be 12 teams involved in the Olympic tournament, with them being split into two groups of six teams. A round-robin is played in each group initially (ie each team plays each other once), before going on to the knock-out round where the four highest placed teams from each group go on to battle for the medals. In other words, the two worst teams from each group are knocked out, effectively eliminating those teams that are not up to the same standard, but got through due to the nature of the qualification tournaments and regions. Of the twelve competing nations, only nine have been decided to-date. Great Britain will feature in the Olympics, as the host nation, after a long absence from impact in international basketball. With the likes of forwards Luol Deng (Chicago Bulls), Joel Freeland (Unicaja Malaga) and head coach Chris Finch (Houston Rockets), Team GB may surprise some on their home court. United States are the clear favourites, as always. Whilst markets for basketball betting at the Olympics are not yet open, as far as I’m aware, there is every likelihood that Team USA will be unbackable. 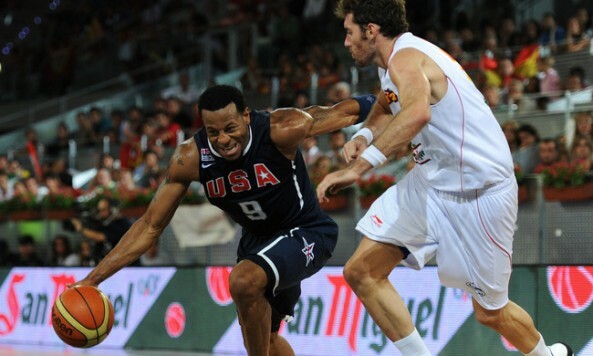 USA qualified for the Olympics via winning the 2010 FIBA World Championships in Turkey. Their team will likely be largely similar to that which won Gold in Turkey and Beijing, with LeBron James, Dwyane Wade (both Miami Heat), Kobe Bryant (Los Angeles Lakers), Kevin Durant (Oklahoma City Thunder), Derrick Rose (Chicago Bulls) and Kevin Love (Minnesota Timberwolves) making for a formiddable core. Tunisia make their way into the Olympics as the winners of the 2011 FIBA Africa Championship after beating traditional African heavyweights Angola in their first ever Championship victory. Whilst Tunisia will likely be present at the Olympics just to make up the numbers, the experience for the likes of 25-year old 7’1″ captain Salah Mejri (Antwerp Diamond Giants, Belgium) will be invaluable. Argentina and Brazil are the two entrants to come out of the 2011 FIBA Americas Tournament (held in Argentina in September 2011). Both are stacked with NBA talent and are traditionally strong competitors right down to the medal stages. Argentina in particular won the 2004 Gold Medal, along with the 2008 Bronze and have a very strong history in basketball. Key players for Argentina include Manu Ginobili (San Antonio Spurs), Carlos Delfino (Milwaukee Bucks), Andres Nocioni (Philadelphia 76ers) and Luis Scola (Houston Rockets). Whilst Brazil’s success in Olympic and World Championship medals came during the 1940s – 1970s, they do boast Tiago Splitter (San Antonio Spurs), Nene Hilario (Washington Wizards), Leandro Barbosa (Indiana Pacers), Anderson Varejao (Cleveland Cavaliers) in their ranks. However it is uncertain how many of those NBA-experienced players will represent at the Olympics. Australia are the representatives from the 2011 FIBA Oceania Championship, after sweeping the three-game series against New Zealand. The disastrous news for the Boomers is that they will be without NBA centre Andrew Bogut, who will be recovering from ankle surgery, however the fine play of San Antonio Spurs guard Patty Mills is very heartening. Australia is led by San Antonio Spurs assistant coach, Brett Brown and boast a fine array of internationally experienced big men and wing players. Spain and France are the two representatives to fight their way out of the 2011 FIBA Europe Championship, in what is always a tough tournament. Spain of course are the main competitors to the USA in recent years, after winning the Gold at the 2006 World Championships and taking out Silver at the 2008 Olympics in Beijing. Pau Gasol (Los Angeles Lakers), Rudy Fernandez (Denver Nuggets), Juan Carlos Navarro (Barcelona), Jose Calderon (Toronto Raptors), Marc Gasol (Memphis Grizzlies) and Congo-born Serge Ibaka (Oklahoma City Thunder) will form the core of the Spanish team, whilst star youngster Ricky Rubio (Minnesota Timberwolves) will miss through injury sustained in NBA play against Team USA’s Kobe Bryant. France are led by Joakim Noah (Chicago Bulls), Tony Parker (San Antonio Spurs), Nicolas Batum (Portland Trail Blazers) and Boris Diaw (Spurs). Whilst they are stacked with talent, they have yet to win an international major tournament. China enter the tournament as the winners of the 2011 FIBA Asia Championship. Whilst they are the power of Asia, they are unlikely to make much noise in London. China is in the unfortunate situation where they have lost superstar Yao Ming to injury, whilst team stars Wang Zhizhi and Liu Wei are aging. They will rely largely on the talents of Yi Jianlian (Dallas Mavericks) and “the Chinese Magic Johnson” Sun Yue (Beijing) for any and all success. The three final competing teams in the Olympics will be decided via a qualifying tournament. There are more quality teams in this qualifying tournament than there are available qualifying positions. Russia, basketball-crazy Lithuania, Greece, Puerto Rico and New Zealand are the best shots at progressing. More previews and analysis to come as the Olympic Games approach. The games will be played from 28 July to 12 August, 2012.